Many people are espousing that we live in a post-Christian culture. That may be true to a large extent, but the Christian Culture Center is here to help guard against that and to restore Christian culture wherever we can, to whatever degree we can. Western culture is becoming more and more secular, and many Christians are finding it harder to share their faith because of it. 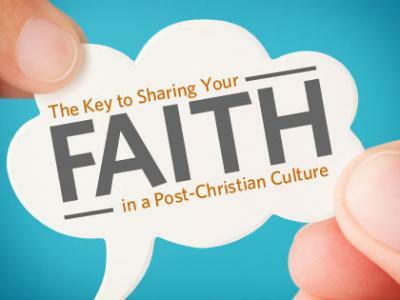 I’d like to share an excerpt from this excellent article on “The Key to Sharing Your Faith in a Post-Christian Culture” in an effort to help overcome the obstacles the world presents in a modern secular culture. 2. Relationship with a “tribe” of four to five other Christians whom they enjoy hanging out with and who make them feel like they truly belong (the focus of this chapter). When all three of these elements intersect the lives of those far from God, it’s amazing how many people find the love and grace of God and bring their network of friends and family along with them. You will begin to see more and more people, once far from God, now following Christ and leading others to do the same. But first we must build relational momentum. Europe, Canada, Australia, South Africa, and much of the United States and even South America face post-Christian barriers to people finding faith. It requires relationship and learning to overcome these barriers. In a post-Christian context, most people do not really know much about the Bible or the life-giving Way of Jesus, but there still exists an awareness of Christianity (usually this awareness comes only from negative media or bias about Christians). Honestly, it would be easier in some respects to reach a culture with zero awareness of Christianity than have to overcome negative stereotypes left in the wake of dying churches, but post-Christian is where much of the world lives. In order for people of post-Christian cultures to become followers of Jesus, they must get to know multiple Christians willing to be open about their own struggles while also demonstrating the hope and fruit of the Spirit-filled life. When non-Christians encounter Christians who act like they never struggle, have all the answers, and suggest quick fixes for every problem, they quickly see through the pharisaical pretense and want nothing to do with that kind of faith. But seeing people who try to love but struggle, who face real setbacks and need encouragement, who get tempted but ask for prayer and support, and who are learning to stay connected to God’s Spirit alongside a loving spiritual community—that’s what the whole world longs for, and that relational momentum draws people to Jesus. But how does a fledgling core group of Christians build relational momentum? The key to sharing your faith in a post-Christian culture is to build relationships with people and share your own experiences of how God works in your life. People love practical examples and favor them over dogma, doctrine and divisive arguments. Share what God has done for you and you’ll get more mileage in your witnessing. Here’s an interesting article I found, published on ligonier.org, about our “post Christian culture.” I almost gasp when I read those words. Really? I suppose so… it’s sad but true. That’s why it’s so important to take a stand for Christ in culture right now. See what you get from this. CHRISTIAN: Evangelist exhorted me to come this way and knock at the Gate, just as I did. He further told me that you, sir, would tell me what I must do next. GOOD-WILL: An open door is set before you, and no man can shut it. CHRISTIAN: Now I begin to reap the benefits of my hazards. GOOD-WILL: But how is it that you have come alone? CHRISTIAN: Because none of my neighbors saw their danger as I saw mine. As pilgrims on this journey to the Celestial City, we must recognize the fact that coming to faith in Christ is the end of our enmity with God, but it is in nowise an end of warfare. Obstinate, Pliable, the Slough of Despond, and Mr. Worldly Wiseman had all been obstacles on Christian’s journey to the Wicket Gate. However, in many ways, the worst still lay ahead. Similarly, our battle with the world, the flesh, and the Devil only intensifies once we have crossed from death to life. Old patterns of thinking, cultural trends, and the constant bombardment of images and ideas can obscure the path to the Celestial City. Entering the Wicket Gate is not the end of the matter. The world may no longer be our “home,” but it is still where we live. And as pilgrims, we must recognize our need to renew our minds constantly (Rom. 12:2), crucify the flesh (Gal 5:24), and resist the Devil (James 4:7). Like Christian, we must war with Apollion and fight to stay on the “straight and narrow path.” Then, of course, there is the temptation of Vanity Fair. And the worst thing that can happen there is not to forfeit one’s life, but to lose one’s witness. The greatest danger to the pilgrim is growing to love something, anything, more than one loves the Celestial City. Therefore, the ordinary means of grace become more important as time goes by. The preaching of the Word, the feast and fellowship of the Lord’s Table: these are the priceless jewels that remind us of the fading glory of the things we know, and cause us to echo the Apostle’s cry: “I count everything as loss because of the surpassing worth of knowing Christ Jesus my Lord. For his sake I have suffered the loss of all things and count them as rubbish, in order that I may gain Christ” (Phil. 3:8).